Maldon East, Essex. Terminus of a line from Witham. An interesting shot of the station viewed from The Causeway crossing gates, giving a general view of the layout. To the extreme left is the wall of the large goods shed. Behind the post of the loading gauge is the engine shed with the capacity to hold four locomotives. At the main platform a two car Cravens unit waits to depart for Witham. 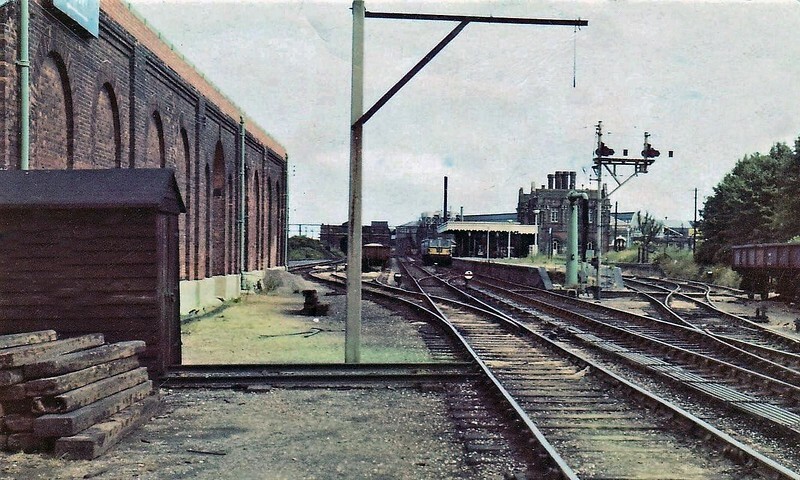 Maldon also had a bay platform to the right, hence the two starter signals. To the extreme right is the line to the loading dock and cattle pens and Upper Station Road running parallel. Very little remains today as the whole area has been redeveloped, but the station house survives as it is a listed structure. This can be seen behind the water pump. Passenger services between here and Witham ceased on 7th September 1964. Freight continued until 18th April 1966. Image with kind permission of Jim Wyatt c1964. Recommended reading:- Branch Lines to Maldon. Peter Paye.